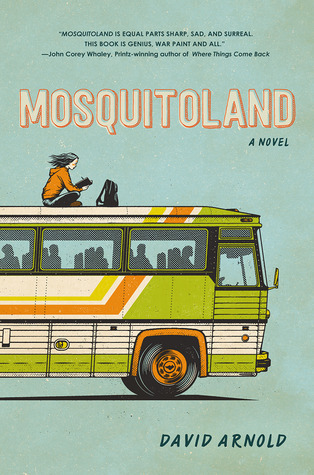 There are major spoilers ahead so if you don’t want to know major plot points for Mosquitoland proceed with caution. At a certain point in one’s reading life, first person narration immediately triggers suspicion of an unreliable narrator. It’s not a terrible starting point because when do people ever tell stories without bias? The conventional wisdom is that everyone is the hero in their own story and this is definitely true of Mim Malone, our unreliable, letter-writing, narrator who runs away from the titular Mosquitoland (her new home in Mississippi) to rescue her ailing mother in Ohio. Mim is smart enough that we can believe in her ability to make the journey and navigate the various practical obstacles, but broken enough for us to question her emotional stability and judgment. Her voice is clear and distinct in David Arnold’s quirky road trip odyssey. This is his debut novel and landed on our list after earning three stars. Amid the buzz however, there’s been criticism aimed at Mim’s understanding and use of her “one-sixteenth” Cherokee heritage. On her blog, American Indians in Children’s Literature, Debbie Reese has written extensively about this issue; I encourage you to check out her posts including one in which David Arnold responds to the criticism. Since that conversation has been so thoroughly and thoughtfully covered, let’s look at some of the other criteria to determine the possibility of seeing Mosquitoland earn a special sticker this winter.